Anyone playing this game is probably young enough to remember the days of sitting in school and pressing the DJ button on the keyboards. Oh how time flies. Look at us now, living life to the full and enjoying some high-quality, bass-pumping DJ themed online slot games. What a life. This 5 reel online play slots casino comes with numerous paylines and an atmospheric stadium rave soundtrack to get your blood pumping as you spin through the reels. Deposit and Spin today to earn yourself some huge cash rewards. ELK Studios is a small Stockholm-based development team which was founded in 2012. They specialise in Mobile Casino games and have invested in technology and building tools with the aim of taking the mobile slots casino experience to the next level. They believe that what makes their company so special is that they work both hard and soft at the same time. They bring characters to life using elegant animations from advanced algorithms. They work within a statistical model in order to create beautiful art. While thousands of players enjoy their games, their servers generate hundereds of transactions per second. ELK Studios love their games, and they are proud of them. DJ Wild is a new dance music themed slot from ELK Studios. The game was Built for mobile/tablet first, with the desktop version coming later on. DJ Wild is a 5 reel, 20 payline game that comes with re-spins as well as sticky, expanding and jackpot wilds. the mobile version was the first slot to let symbols cover the whole of the screen and the desktop equivalent is equally impressive. You (the player) can bet from 0.25 and 100 per spin and can automatically spin up to 100 times. 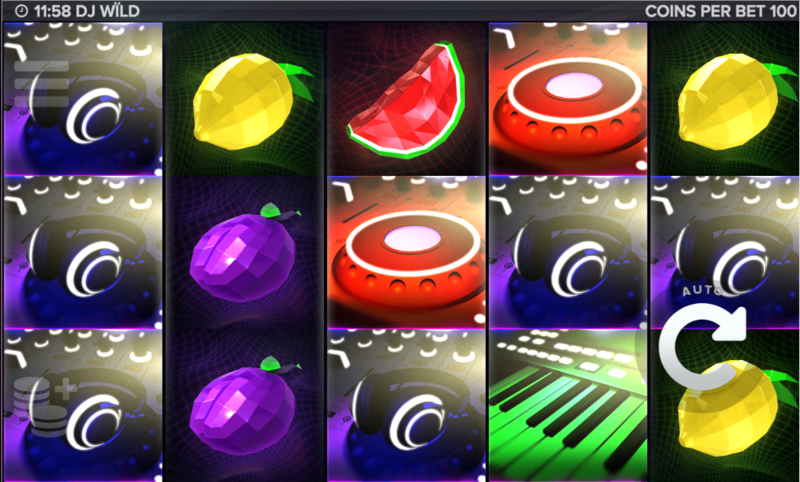 The symbols used in this game include a selection of futuristic looking fruit as well as assorted DJ equipment such as mixing desks, headphones and synth keyboards while the animations are synced with the music. Wild DJ comes with three extra elements,blasts of confetti, fireworks and smoke which greet the arrival of the expanded vertical sticky wild which can turn all 3 symbols in a column wild. Keep an eye out too for the strobe and light which mark the horizontal sticky wilds. More Easy slot promotions, visit EasySlots.com. Having the DJ Wild symbol on reels 1, 2, 4 and 5 is possibly the best configuration that you can get as this leads to the expanding wilds with a re-spin following with the sticky wild. Extra wilds are added to the reels during the re-spins which increases the chances of the player landing more re-spins. To get the jackpot, you will need to land the jackpot wild in the middle reel with the DJ Wild symbol on the other reels. The play feel of this game is, like its soundtrack, quite upbeat. The easy slot itself is quite volatile and expect some areas of time where the win tempo will seem relatively low in comparison to other occasions you may experience. However, this can all change once you hit a re-spin or the sticky wilds as you could end up with some high winnings. To summarise, this game is very well designed, volatile and features enough extras and added bonuses to keep the player interested. The soundtrack helps keep the player invested in the game as it helps the game feel complete. However, if this kind of music isn’t your thing, you can always just play for the chance at a maximum of 1,700 times stake win. Another good game to try is our Vikings Go Berzerk Slots Game.